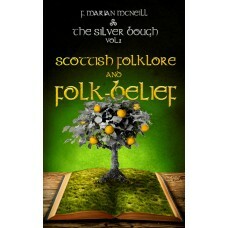 The Silver Bough is an indispensable treasury of Scottish culture, universally acknowledged as a classic of literature. There is no doubt F Marian McNeill succeeded in capturing and bringing to life many traditions and customs of old before they died out or were influenced by the modern era. This, the first volume of The Silver Bough, deals with Scottish folklore and folk-belief. There are chapters on the ethnic origins of the national festivals, the Druids, the Celtic gods, and the slow transition from Druidism to Christianity. There are accounts of magic, the fairy faith, second sight, selkies, changelings and the witch cult, including tales of “witches” being hung, or worse. There are old familiar rhymes and a wealth of information on the Scotland of old, now gone for ever, where the people feared witches and “faeries”. Readers are bound to find something fascinating about somewhere in Scotland they didn’t know before. As man makes greater and greater advances in the understanding and control of his physical environment, the river between the known and the unknown gradually changes its course, and the subjects of the simpler beliefs of former times become part of the new territory of knowledge. The Silver Bough maps out the old course of the waterway that in Celtic belief winds between here and beyond, and reveals the very roots of the Scottish people’s distinctive customs and way of life.